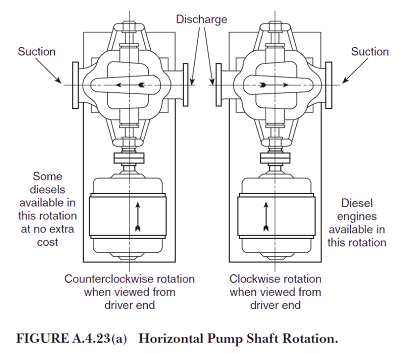 For a horizontal split-case fire pump the rotation is defined by looking at the drive side of the pump unit. This means that if you were sitting on the motor and looking at the pump, a right-hand (clockwise) rotation has suction on the right and a left-hand (counter-clockwise) has the suction on the left. Make sure that you verify your orientation when looking at the pump. Also don't forget there are no UL/FM listed "left hand rotation" diesel engines available on the market. Just one question, why, while designing the impeller, was the direction of rotation (relative to the involute) chosen as it is? It obviously has to have some advantage over designing the pump for a reverse rotation.